The first “star” of Cincinnati television died recently. I use quotation marks because Helen Diller Hinn would've gotten a big laugh from that opening sentence. Helen was 96 years young when she passed away quietly at her apartment in Lancaster, California on March 24, 2014. 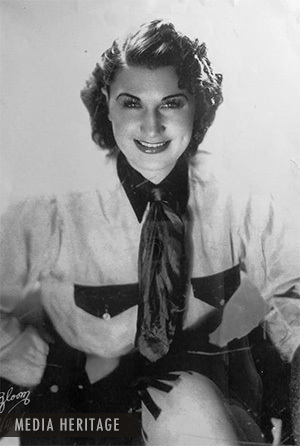 Born in Winnipeg in 1917, Helen Diller was already known as the “Canadian Cowgirl” when she won a contest and was hired in 1937 by WGN Chicago program director George Biggar to join the cast of The National Barn Dance radio program. But in the time it took Diller to wind up her affairs in Canada and say goodbye to her family and friends, Biggar had moved on to WLW in Cincinnati to start a new national barn dance program: The Boone County Jamboree. Diller was invited by Biggar to exchange her train ticket to Chicago for one to Cincinnati and WLW had its newest young talent. Helen participated in the Jamboree but also sang and yodeled on the daily Top O' the Morning show as well as the station's traveling road performances. It's this willingness to help that likely led to Helen's volunteering to take part in public demonstrations co-sponsored by Philco and Crosley at the downtown Pogue's Department Store between September 19th and 23rd, 1939. On display? This newfangled electronic device called television. Admittedly, several WLW radio performers took part in the demonstrations under the sweltering hot lights, including vocalist Janette Davis, but it was Helen Diller who just happened to be first and was forever enshrined in a poignant article declaring the futuristic hopes for the new technology on the pages of the Cincinnati Enquirer. The events of the day didn't seem particularly special to the young Helen, however, who had forgotten about that day for several months until a co-worker gave her a copy of the newspaper article for her scrapbook. For Helen. it was just another day at work—another public appearance—to her. She had no recollections of what she may have sang or what she wore, other than her typical cowgirl costume. Incidentally, decades later, the folks at Gibson guitars got wind that Helen still had the now-rare Gibson Advanced Jumbo guitar she played on camera that day and acquired it for display at their Gibson Factory Museum in Memphis. It would be over eight years and one World War before Cincinnati received its first commercial television station in 1948 and, by that time, Helen Diller had married WLW news announcer Michael Hinn and the couple left Cincinnati in 1941. Michael went into the service and after stops in various military bases out West, the post-war couple settled in California where Michael continued his announcing career and Helen largely retired from show business. In recent years, Helen was a great friend of Cincinnati broadcast history, though, and was an active member in Media Heritage and she will truly be missed.